Your home is a blank canvas on which you can paint and showcase your artistic nature. Every single item of the décor speaks volumes about you as a person. However, today the trend is towards minimalism; and minimalistic wall floating shelves offer a smart and inexpensive way to utilize vertical space while adding panache to your home. Whether you want to de-clutter a room or show off your possessions, wall floating shelves can be customized to suit your needs and space. You can fill a whole wall with floating shelves or position a couple strategically to completely transform the room in a jiffy. 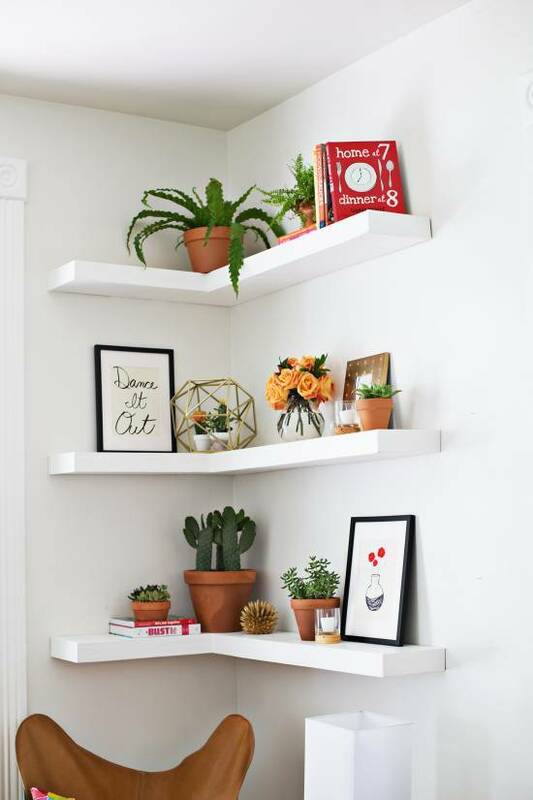 If you are still wondering the kind of wall floating shelves you should go in for, here are 11 trendy floating shelves that are perfect for homes in this day and age. Nothing brings a room together like a square floating shelf. You can group the squares together to create an asymmetric pattern on the wall. Or, you can hang each shelf separately to turn it into a gorgeous accent piece. The shelf is perfect for small decoration items or even a lightweight potted plant if you are looking to bring the outdoors into your home. This set of three square shelves comes in three varying sizes – small, medium and large. The stunning espresso finish gives the shelves a sleek and polished appearance and ensures it blends with any kind of décor. 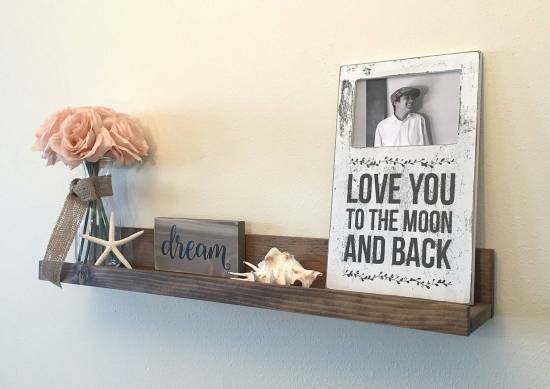 Crafted out of MDF wood, the set of three square floating shelves is easy to mount on the wall, and comes with detailed mounting instructions. More often than not, corners are under-utilized in homes. All that space just goes for waste as people cannot come up with ways to use it while retaining the beauty of the room. Now, you can use the corners of your home with corner floating shelves. These shelves do not eat up space. Instead, they allow you to use under-utilized corners in your home. Made from resilient and long-lasting laminated MDF, this five-tiered wall-mounted corner shelf is not only functional but also attractive to look at. The stunning espresso finish is eye-catching and can blend with nearly any type of décor. It can be installed in the bedroom, living room, dining room or even a home office to make practical use of the space. Why opt for flat or any other shape when you can transform a room with a U-shaped floating shelf? The set comprises three shelves of varying sizes – small, medium and large. The best part is that you can hang the shelves with the arms facing upwards or downwards, depending on the kind of effect you want to create in the room. 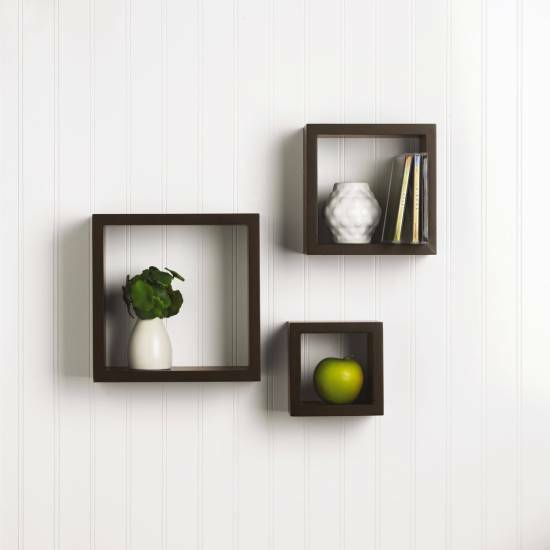 This small wall floating shelf is made from MDF and laminate and has a walnut finish that matches any type of décor. You will not be able to see connectors or hanging hardware even though you will be using the hardware (which comes with the shelves) to mount each shelf. 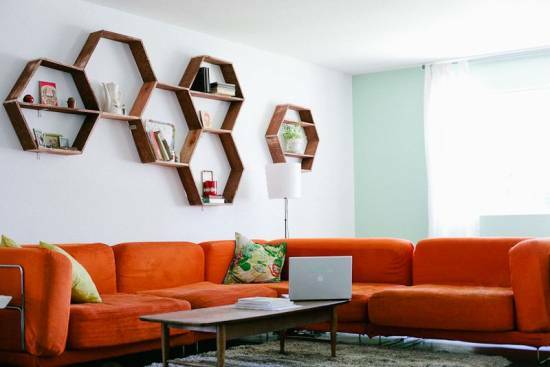 There is something unique and attractive about this hexagon-shaped shelf. In fact, this shelf is so popular that you will find many DIY videos that teach you how to make the shelf at home. Although a simplistic shelf, it can add beauty to a wall because of its polished finish and unique shape. The honeycomb shelf is bound to be the focal point of your décor. It comprises three honeycombed shelves that are attached to one another since they share a side. Just make sure that the overall shape is asymmetric to add more depth to the wall. You can also fit in another shelf in each honeycomb to create additional shelf space to showcase your object, art or other decoration items. This handmade shelf is a true winner. It is made from one-inch thick wood and has a depth of 5.5 inches. The sides of the triangle are about 22 inches long. 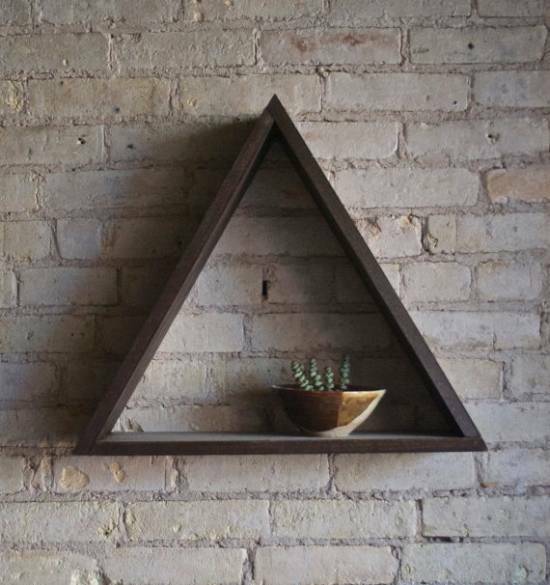 You can mount a single triangle floating shelf or multiple triangles to create a unique pattern. Either way, this functional and decorative floating shelf will be the cynosure of all eyes. You can use the triangle floating shelf to mount small, decorative pots, books and other knick-knacks that you want to present to the world. You need just a single nail to hang the shelf, which is made from poplar wood. The wood is richly stained with walnut stain, giving it a natural wood tone. If you like, you can even opt for Jacobean stain, which imparts a warm ebony tone to the wood. The rustic wooden long floating shelf is perfect for modern homes that want to break the monotony of the wall with superior quality pine wood. The shelf makes the room feel more welcoming and warm with its pastoral feel. It is available in a range of finishes, including Aged Bard Wood, Dark Walnut, Sunbleached, Weather Grey and Kona Brown. It is the perfect shelf to proudly display quotes, family photographs and other small decoration items. The length of the shelf can vary, right from 24 inches all the way to 65 inches. However, the width stays the same. Inside width of the shelf is 4 inches while the overall width from the outside is 6 inches. If you are looking to organize your room and make it more presentable and neater, there is nothing better than a corner L floating shelf. 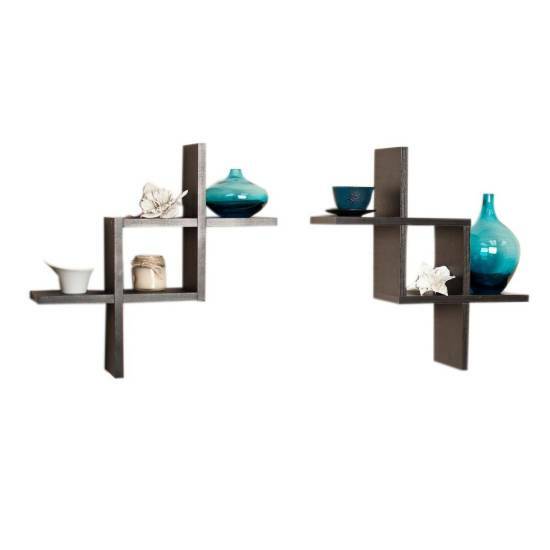 Made without using bracket, this L-shaped shelf is sturdy and attractive. It is made up of a supporting base over which the shelf is fixed with the help of nails. Caulk and paint mask the nails so you don’t have to worry. The way the shelf is constructed makes it secure and durable. It is strong enough to take a lot of weight and can be painted to blend in with the wall. Or, you can use a contrasting color to make the shelf stand out. Once finish, it forms a corner mantelpiece where you can display potted plants, photo frames, books and more. A contemporary home needs a modern touch, and a curved floating shelf fits the bill perfectly. The wave pattern of the shelf is innovative and visually appealing, and the shape does not detract from its functionality. It can be used to neatly store books and decoration items. Made from wood, you can even have a dual-wave pattern and separate the resultant shelf with internal vertical wooden boards to form compartments. The space can turn into a unique and attractive bookshelf; and the upper part of the curved floating shelf can be used to display other decoration items and adornments. 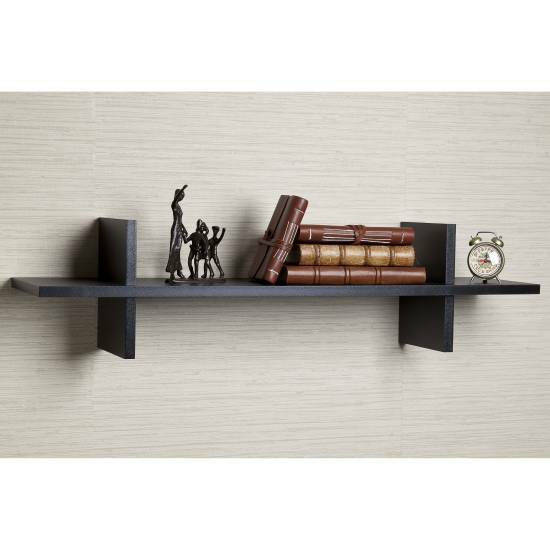 The H-shaped wall floating shelf is quite popular and perfect for contemporary homes that want to make good use of vertical spaces. The H-shape of the shelf breaks the display area into three distinct parts, making it perfect for small and big decorative items. It is made from MDF and laminate and requires minimal upkeep. The H-shaped wall floating shelf is an accent piece that can immediately elevate a room by enhancing its beauty quotient. The simple clean lines of the shelf make it minimalistic. That is why it fits seamlessly into any décor without being overpowering. Since ancient times, trees have been synonymous with knowledge and wisdom. So, it is befitting that you install a tree floating shelf in your home for your books. 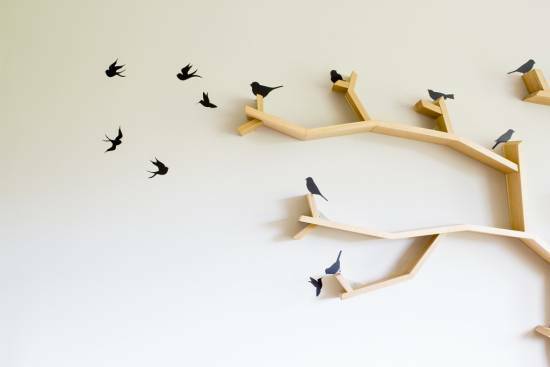 The design of the shelf is inspired by the branches of a tree. 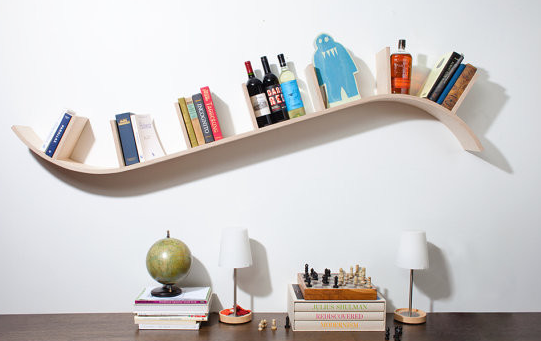 The ‘trunk’ bifurcates into numerous branches that form individual shelves. The shelf is made from beech wood and is naturally stained to retain the original look and feel of the lumber. Since it has numerous branches or shelves, you can use it for more than just books, though its original function is a uniquely designed bookshelf. When space is a constraint, you cannot go wrong with a criss-cross floating shelf. You can mount it onto a door or any space where you cannot install large shelves. 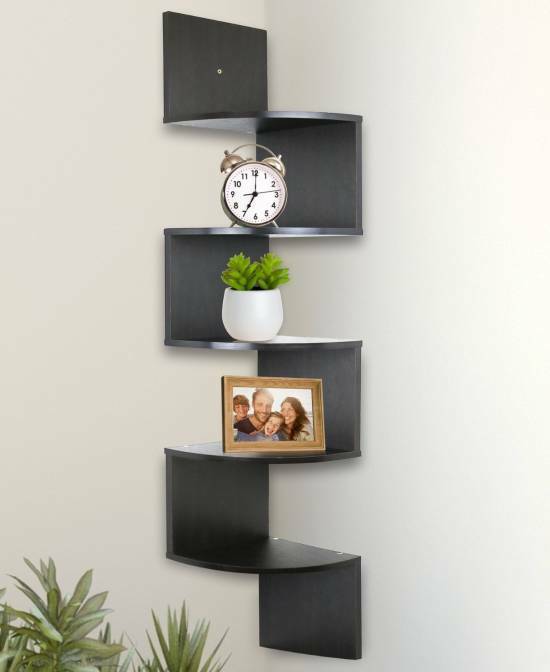 Made from laminated MDF, this shelf is satiny black in color. It comprises two reverse criss-cross shelves that require some hardware to mount them on the wall. However, the design of the shelf ensures no hardware is visible to the naked eye. The shelf space is 5 inches deep, making it perfect for small potted plants, photo frames and small collectibles. The design ensures you have ample shelf space for the items you want to showcase to the world. The shelf can turn into a focal point if you place it strategically in the room. 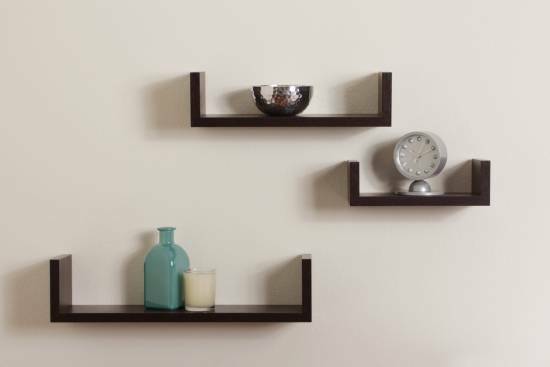 Wall floating shelves are unique because of their minimalistic style. As a result, the shelves are ideal for exhibiting any decorative item or collectible that you want people to take note of when they enter the room. These 11 trendy wall floating shelves of 2017 are the perfect addition to a contemporary home that wants definition and beauty while making the best use of vertical space. You cannot go wrong with these shelves. Once you win praises and accolades for your taste and style, you will be grateful that you picked one of these trendy floating wall shelves for your home.